Greg was an intelligent, affable 17-year-old high school senior. Based on his test scores and achievements, he could have expected to get into a competitive college and become a successful undergraduate. But something was wrong. In the first term of his senior year, Greg's grades nosedived from As to Ds and Fs. He did no school work and began skipping school. He spent most of his waking hours (usually noon to 4 AM) closeted in his bedroom, wearing a headset and staring intently at a computer screen. He rarely spoke to his parents, or anyone outside of his online friends with whom he played World of Warcraft. Greg seemed to be failing life, but he was "the best holy paladin on his server." His WoW guild topped the charts on wowjutsu.com, and as a leader in the guild, he was responsible for studying YouTube videos to plan strategy for advanced raids. Greg's parents were frightened and appalled. By the time they contacted me, they had canceled his WoW account, turned off the internet, and demanded that Greg get back to school. They were shocked when he became violent, which led them to call the police, which led to a brief psychiatric hospitalization. In order to be discharged from the hospital, Greg promised to keep away from the game, but it wasn't long after his return home that he was playing again. This left his parents with a terrible dilemma: confront his habit and risk crisis, or tolerate the loss of their son, and seemingly his future, to an online universe that they barely understood. As a clinical psychologist, I'd heard many tales of "internet addiction" and seen other clients who ran into troubles like Greg's. I was impressed with their passion for gaming and surprised by the sacrifices they made to sustain it. As I listened to these clients, I found myself wondering: What is so compelling about these games? How do they end up taking over people's lives so dramatically? As a middle-aged adult, I had no experience with MMOGs. I had dabbled in more traditional videogames, but these seemed manageable diversions that soon became boring. Clearly, WoW was something of a very different order. Around the same time that I was talking to Greg, a colleague sent me an invite to play for free. For ten days, I would have a chance to gain first-hand experience and insight on the game. 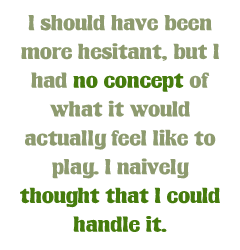 Having seen what Greg went through, I should have been more hesitant, but I had no concept of what it would actually feel like to play. I naively thought that I could handle it. In the beginning, I was a bumbling noob. My colleague and her friends helped me along. I picked up what I could from them, and at the end of ten days, I was having fun and figured it would be harmless to invest the money and play a little longer. A little longer turned out to be a year.